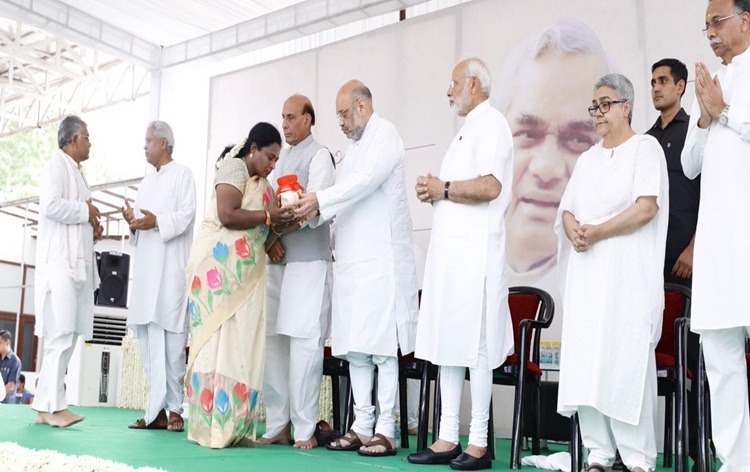 Prime Minister Narendra Modi along with BJP chief Amit Shah handed over the ashes of Atal Bihari Vajpayee to the party's state unit presidents at a function in New Delhi today. The BJP will take out yatras with urns carrying ashes of the former Prime Minister in all districts and immerse those in rivers across the country. The urns with the ashes' of former Prime were immersed at Tawi river in Jammu city this evening. These were immersed in the river by BJP State president Ravinder Raina who was accompanied by MoS in PMO Dr.Jitendra Singh and other senior leaders.